The proposed SoccerCity development would generate nearly 97,000 vehicle trips per day in Mission Valley by 2035, according to a traffic study released Friday by the San Diego Association of Governments. The SANDAG Service Bureau was asked to perform the study by both proponents and opponents of the proposed redevelopment of the SDCCU Stadium property, which is scheduled to go before voters next year. The ballot measure is likely to compete with an initiative that would grant rights to the land to San Diego State University for campus expansion. The study did not look at the SDSU proposal. SoccerCity’s 4,800 housing units and 3.14 million square feet of office space and commercial establishments would result in an estimated 9,000- plus new residents and almost 10,500 jobs, according to SANDAG. The roughly 97,000 average daily trips at SoccerCity “includes residents and their visitors, site employees, individuals frequenting commercial locations, hotel visitors and those seeking to use the recreational areas, as well as commercial vehicles servicing the residents and businesses at the site,” the study says. The authors also estimated that a SoccerCity resident would drive fewer miles than the average San Diegan, and travel by foot or bicycle more often. Additionally, they said the Green Line trolley stop now known as the Qualcomm Station would see 5,100 passenger trips in an average day, the most of any stop other than the major transit hubs — like the 12th and Imperial or Old Town transit centers. The results brought scorn from those behind SoccerCity. “This badly flawed analysis shows a serious and concerning deficiency in SANDAG’s analytic capability,” said Nick Stone, the SoccerCity project manager. He was referring to a flawed revenue forecasting projection for a SANDAG- generated ballot measure that would have raised the countywide sales tax to pay for transportation and environmental projects. Voters weren’t told about the error before they went to the polls, though the measure failed to capture the two-thirds vote necessary for passage. According to Stone, the SANDAG model ignores the benefits of mixed- use, transit-oriented development and severely undermines what the city is trying to accomplish with planning to address the region’s housing crisis and reduce greenhouse gas emissions. Councilman Scott Sherman, who represents the area and has endorsed SoccerCity, said SANDAG has “zero credibility left” after the Measure A fiasco. 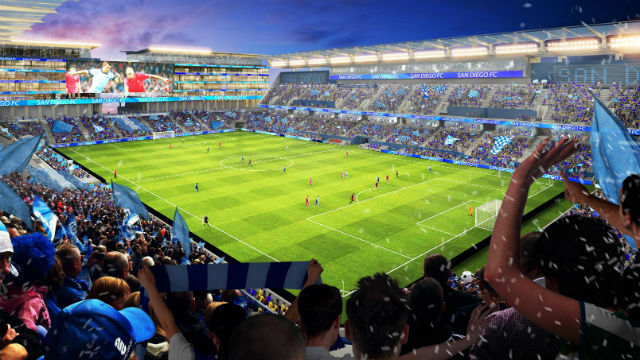 According to SANDAG, both SoccerCity and its opponents, the Public Land Public Vote Coalition, were consulted ahead of additional modeling work and in the development of the final report, and that considerable time and effort were taken to address issues raised by the parties during the process. The fee to conduct the study was split evenly by both parties that requested the work, SANDAG said. The agency’s Service Bureau performs modeling work for a fee at the request of public and private organizations.